The next scheduled General Members Meeting is on Thursday, the 21st September 2017, starting at 10:00am. Our Chair, Mr. Tony Rosa, has invited the Chief Operating Officer – AGCO – Mr. Tom Mungham to present to the members. It has been some time since Tom has addressed the membership and Tony felt that it was the right time to invite him, which Tom has duly accepted. Please see the details of the meeting below. If you intend to be present, could you please e-mail our Administrator, Ms. Sandi Nesbitt, at nesbitt.s@sympatico.ca. 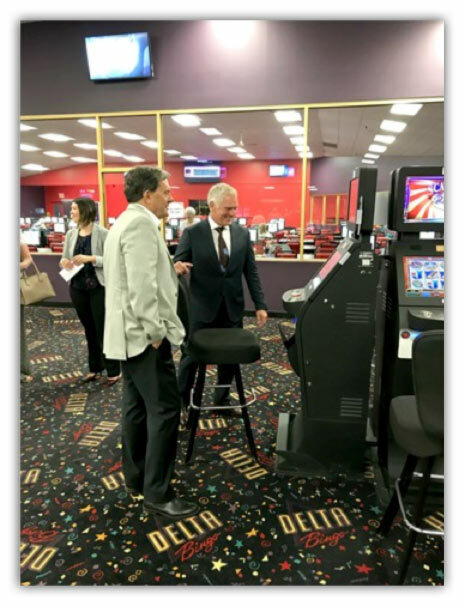 The Delta Gaming Group has continued the Group’s celebration of its 50th year of continuing business and partnership to the communities they are located in. During the course of the summer, work has continued to refine and make minor updates to the training module. We are now in a position where this will be tested with our partners (on this project) the AGCO, by AGCO team members, which is tremendous and that is set to occur this week. As we have stated before, this is an important initiative and ground breaking for the Community Gaming Sector, where we are partners with our regulator to bring forth a module training platform and we are rather excited about this opportunity. This project is being led by our Policy Advisor, Mr. Don Bourgeois, with firm and focused support from the Board of Directors (CGAO) and AGCO representatives. What is important to remember is this is a pilot and they are designed to flush out critical elements to enhance potential programs for the future. It was been announced over the summer [August] that Pollard Games will undertake the ownership of Innova Group. The CGAO wish Diamond Game continued success with their new parent company. Should you have questions, please contact Mr. Peter Howard at Diamond Game. I recently had the opportunity to meet with representatives of the Victorian Gambling Commission (Australia) in their offices in Melbourne. The Australian Gambling Sector is very vibrant at this time with a range of activities from Casinos/Slots, Horse Racing, Bingo and Online/Sports betting. It is extremely useful to get this exposure and connection to different markets and approaches. It is odd that you can be on the other side of the world and the broad challenges are very similar indeed. The key thing, I believe, is building constructive and productive relationships with your partners/stakeholders. The province of Quebec is gearing up to launch a c-Gaming pilot in five (5) Centres. This will be a mixture of sizes and locations. The bingo system has been selected (‘Planet Bingo’) and as well is launching with a bingo product portfolio. It is projected to launch later this year [November] and the pilot is scheduled to run for a period of twelve (12) months. We wish Mr. Francois-Patrick Allard and his team, combined with the industry, every success as they begin this journey. Just a reminder to all, please be advised that from the 1st August 2017 the CGAO will be changing its registered office address from Toronto to Windsor as indicated below.